묘법연화경은 줄여서 ‘법화경’이라고 부르기도 하는데, 우리나라 천태종의 근본경전으로 부처가 되는 길이 누구에게나 열려 있음을 기본사상으로 하고 있다. 화엄경과 함께 우리나라 불교사상의 확립에 크게 영향을 미쳤으며, 삼국시대이래 가장 많이 유통된 불교경전이다. 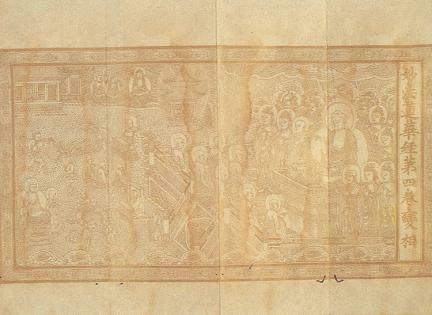 이 책은 후진의 구마라습이 번역한『법화경』 7권을, 고려 우왕 3년(1377)에 하덕란이 죽은 어머니의 명복과 아버지의 장수를 빌기 위해 정성들여 옮겨 쓴 것이다. 하얀 닥종이에 먹으로 썼으며, 각 권은 병풍처럼 펼쳐서 볼 수 있는 형태로 되어 있다. 접었을 때의 크기는 세로 31.8㎝, 가로 10.9㎝이다. 각 권의 표지에는 금·은색의 화려한 꽃무늬가 장식되였고, 금색으로 제목이 쓰여져 있다. 또한 각 권의 첫머리에는 책의 내용을 요약하여 묘사한 변상도(變相圖)가 금색으로 세밀하게 그려져 있다. 책 끝부분에 있는 일본인이 쓴 기록을 통해, 세종 25년(1443)에 일본으로 유출되었으며, 선조 38년(1605)에는 광대원(廣大院)에 소장되었음을 알 수 있다. 이 책은 책을 쓰게 된 경위를 적은 글과 변상도를 모두 갖추고 있고, 보존상태도 양호할 뿐만 아니라 일본에서 되찾아온 문화유산이라는 점에서 귀중한 자료로 평가된다. 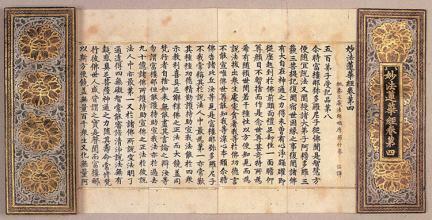 Saddharmapundarīka Sutra is often called by its shortened name the ‘Lotus Sutra.' 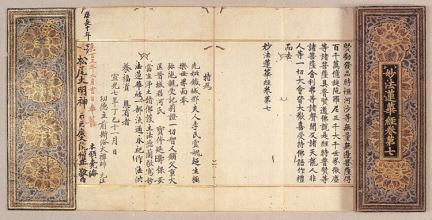 It is the principal scripture for the T'ien-t'ai Sect. The main idea of the book is that the way to become a Buddha is be open to everybody. 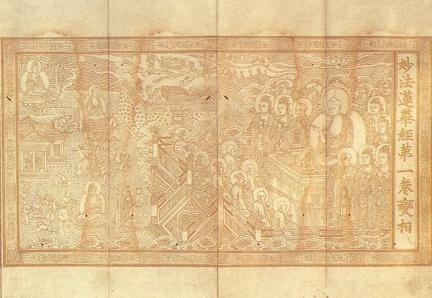 Along with the Avatamsaka Sutra, it has made a great influence in establishing Korean Buddhist philosophy. 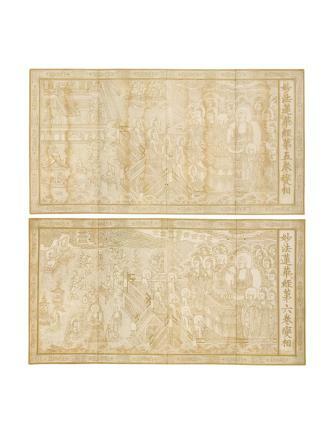 It is the most widely circulated Buddhist scripture since the Period of Three Kingdoms. 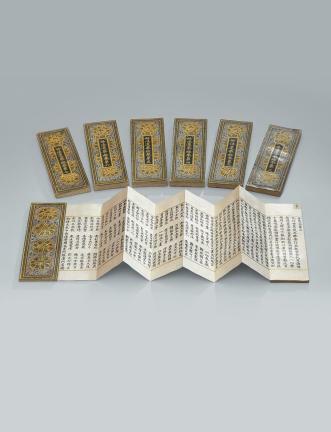 This book contains the seven volumes of the Lotus Sutra translated by Kumārajiva of the Late Chin of China. 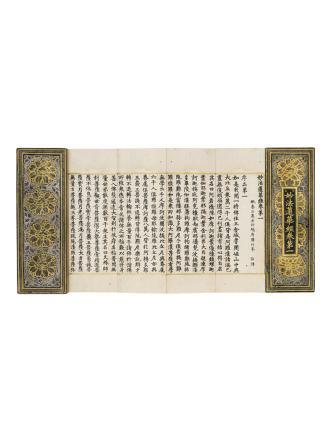 The scripture was carefully hand-copied by Ha Deokran in 1377 (the 3rd year of King U of Goryeo) with a prayer for longevity of his father and soul of his deceased mother. 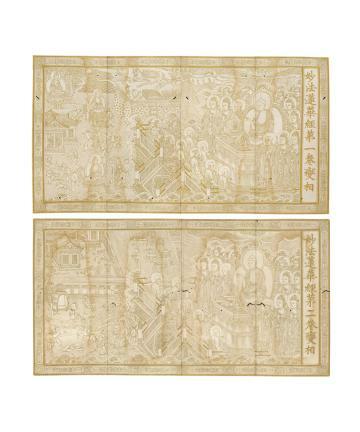 The contents were written in ink on white mulberry papers. 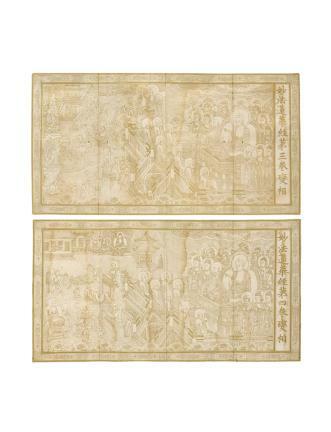 Each volume is made in the form of a folding screen 10.9cm long and 31.8cm wide. On the cover of each volume is a magnificent picture of flowers painted in gold and silver. The title of each book is also written on it in gold. 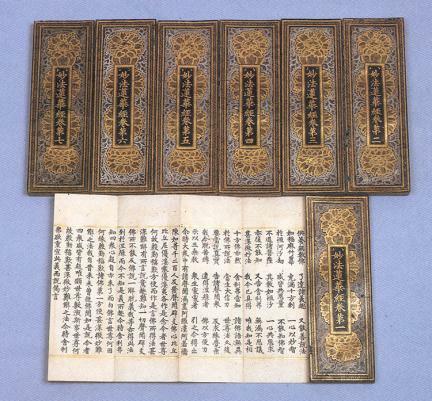 At the beginning of each book is a detailed painting of the summary of the content colored in gold. 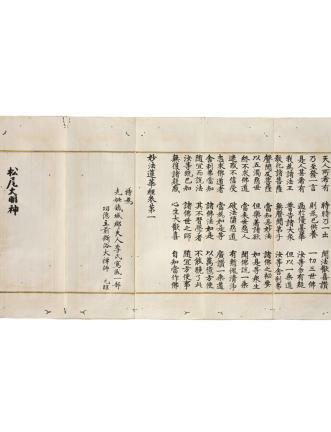 From a remark left at the end of the book by a Japanese we can tell that this book had been taken to Japan around 1443 (the 25th year of King Sejong of Joseon) and kept in the royal storage of Gwangdaewon since 1605 (the 38th year of King Seonjo). This book contains both the writings that tell the reason why this was produced and the painting that summarizes the content. It has been kept in a relatively good condition. 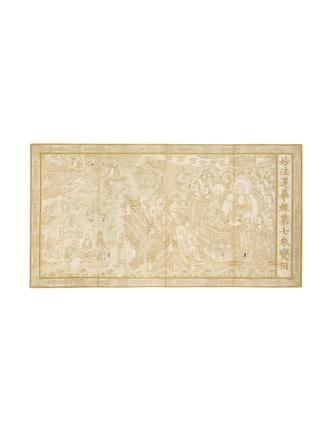 In particular, having been recovered from Japan, it is considered as a valuable cultural asset.